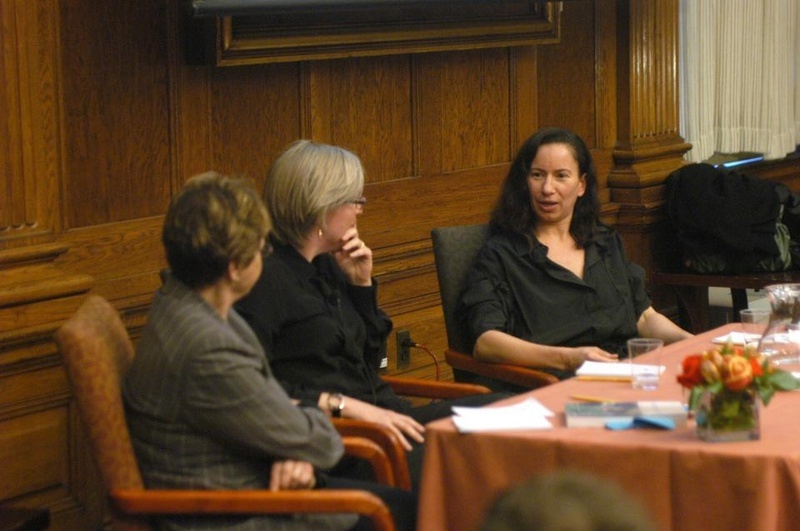 Andrea Fraser, an artist and UCLA art professor, participates in a panel discussion as a part of the “Church of What’s Happening Now: New Art, New Artists” lecture series. Working her way through the legacies of conceptual and appropriation art, Andrea Fraser, an artist and UCLA art professor, uses performance and video to engage in institutional critique—the investigation and questioning of the structures and dynamics of the art world. The Carpenter Center currently exhibits “Andrea Fraser: Boxed Set,” which will run until April 4. After participating in a discussion with Marjorie Garber, a professor of English and Visual and Environmental Studies, and Helen Molesworth, the chief curator of the Institute of Contemporary Art, Boston, as a part of the “Church of What’s Happening Now: New Art, New Artists” lecture series, the artist sat down with the Crimson to answer some questions about the development of her career. The Harvard Crimson: You were only 23 for Museum Highlights and even younger for your work with The V-Girls. How did you move from high school to the art world? Andrea Fraser: I started doing museum tours in 1986 when I was twenty. It was at an exhibition at the New Museum of Contemporary Art in New York in the summer of 1986. I only did two years of high school. I moved to New York in November in 1981. I applied to the School of Visual Arts. They accepted me and I started in January. So I went to art school and met a brilliant young art critic, Craig Owens—one of the chief formulators of post-modernism in the arts... I heard about the Whitney Museum’s independent study program... and he encouraged me to apply. So I dropped out of art school and started at the Whitney program at 18. I did that for one and a half years. Toward the end of my stay there, I published my first article, which was about Louise Lawler. The following summer, I did my first museum tour. THC: The sociopolitical and economic conventions of art institutions can be examined and challenged in more literal forms like essays. Why did you choose to do so from an artistic approach? Do you believe one method is more effective and if so, why? I think an essay, which sort of sits on a page, can function in many of the same ways as a performance. I want [the essay] to not just sit on a page, but do something and perform. THC: You often work by appropriating, rewriting, and taking on a role in your performance pieces. But, more recently, you’ve been creating works that present yourself not in an invented role. Why? AF: Well, I think from a number of perspectives, it’s not as easy to distinguish what is me and not me. We have our names and specific biographies, but even our names are amalgams of other names like our parents’. And from a psychological and psychoanalytical perspective, we can think of people as being collections of other people and their relationships. Or collections of relationships that we have internalized and even things that we have invested our attention in and taken into ourselves. In a way doing the kind of work I did, it’s sort of about appropriation—I was making the process explicit and performing it. THC: You discussed how you have moved from the view of being against art institutions to their defense in your career. How has your definition of institutional critique changed? AF: I hate to say this, but there’s a lot of anti-institutionalism in the art world and elsewhere; however, at this point, I have to think about it as being a little adolescent. Of course, we want to be free on some level from institutional constraints and not only institutional but social determination. Art is a space of freedom where you can invent yourself and the world. [But] artists can’t invent meaning themselves. What works come to mean and how they exist in the marketplace and history is external to our control. That for me was the radical recognition now associated with institutional critique. If one thinks of this in this manner, it can go two ways. One was even more of a reaction: once we know how determining institutions are, let’s escape them. There was some of that impulse in me and my early work. On the other hand, anyone really looking at institutional critique and the practice associated with it could see that it was never about escaping institutions. Like Marcel Duchamp’s “Urinal”—an object only takes on a specific meaning as an art object within a discourse with the history of art and within these institutions. Instead [of trying to escape] one is left to struggle within this discourse. THC: Artistic intention and viewers’ interpretation don’t always agree. Do you believe your intention for the work trumps their interpretation? AF: It’s been my official ideology for a long time that there are no wrong interpretations. As artists, we put a lot in store in our own intentions. We intend our works to mean some things, and that’s what we want the viewer to get and understand. What an artwork means broadly in society as a particular kind of cultural object is first of all overwhelmingly defined by the fact that the artwork exists and is recognized as being a work of art. And very often, I don’t think artists always consider the field of meaning outside of intention. With my own work, my position is that you are responsible for all of it. Even if you did not intend it and even if it seems like pure projection on the viewer’s part, you are making this thing and putting it in the world.